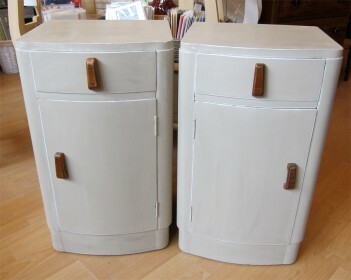 A pair of 1930's curvy bedsides that have been painted using Annie Sloan Country Grey, sanded back on the edges (picks up the white undercoat), then waxed and buffed. In total there are five coats of paint on these, two undercoat, one stain stop and two top coats. We have kept the original handles, and we left the inside unpainted as they are very clean. The final result is very attractive, and these are a lovely pair of bedsides. Please click on the photo and the thumbnails to see larger photos.